You will be given a Free reference e-book to read which has 1082 pages And the test will be based on that e-book. What is CompTIA Linux +? CompTIA Linux + certification refers to a vendor-neutral and high stakes certification which works effectively in validating the fundamental skills and knowledge needed by junior Linux administrators. In order to be certified, you need to take and pass 2 major examinations namely the LX0-101 and the LX0-102. The first exam (LX0-101) basically covers the architecture of a system including package management and installation of Linux, UNIX and GNU commands, standards for file system hierarchy, file systems designed for Linux and its major devices. The second exam (LX0-102) focuses on topics related to shells, desktops and user interfaces, data and scripting management, security, fundamentals of networking, vital system services and administrative tasks. Receiving a CompTIA Linux + certification is a major help in your attempt to show proof of your knowledge about the basic installation, troubleshooting and operating procedures for different systems designed for Linux. Your received certification also allows you to work confidently because you know that you have a strong background on open source licenses or resources, file permissions, local storage devices management, software configurations, network protocols and user administration. Fortunately, a free CompTIA Linux + practice course is now around to help you deal with the process of acquiring a certificate in this specific field. Enrolling in this practice course gives you the chance to take advantage of the company’s detailed study guide which talks about all topics relevant to CompTIA Linux + as well as a free practice test which can help in preparing you towards the actual exam. One of the most impressive free practice courses that you can now easily access at Brainmeasures is its CompTIA Linux + certification practice course which is extremely beneficial for you especially if your desire to work as a certified CompTIA Linux expert is strong. The good thing about this practice course is that it comes with a comprehensive free study guide which covers everything that you need to learn about the field to increase your chances of passing the test. A free CompTIA Linux + practice test is also included in the course and this is a major help in your attempt to know how the actual exams for aspiring CompTIA Linux + certification holders take place. With the help of this free practice test, you can easily assess the level of your knowledge about the field and if whether or not your background about it is already enough to help you in successfully handling and passing the actual exam. How to effectively work with optical devices and floppies? How to effectively manage groups and users? How to install and manage software, programs and applications on Linux? How to efficiently redirect inputs and outputs? 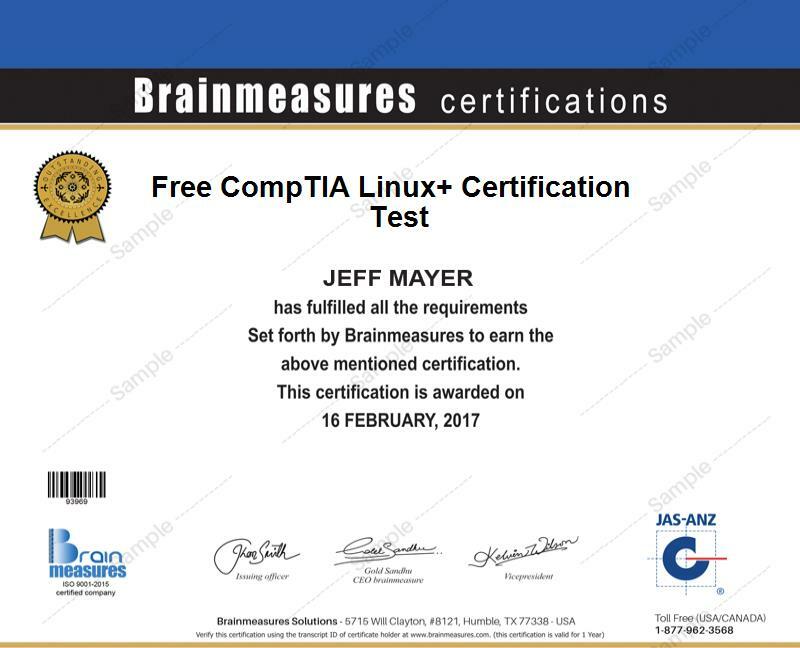 Anyone who intends to receive a CompTIA Linux + certification can definitely benefit from the free CompTIA Linux practice course which is now available at Brainmeasures. It caters to the needs of all aspiring and existing administrators of systems, networks, web services and databases to guarantee the successful implementation of an IT infrastructure. Receiving an even higher salary is also a great possibility after you finally receive your CompTIA Linux + certification. It increases your chances of becoming a more effective junior Linux administrator and receive at least $57,000 yearly from this profession. Working as a Linux database administrator is even more financially rewarding since it lets you enjoy around $61,000 to $115,000 yearly.